1(a) Explain the block diagram of DC motor control. Name any four strategies for DC motor speed control. 1(b) Why only IGBT/MOSFET are preferred over thyristor in an inverter? Justify. 1(c) Draw torque – speed characteristics of three phase induction motor during plugging, motoring and generating modes. 1(d) With the help of neat block diagram explain the working of SMPS. 1(e) Give the significance of slip in AC motors. 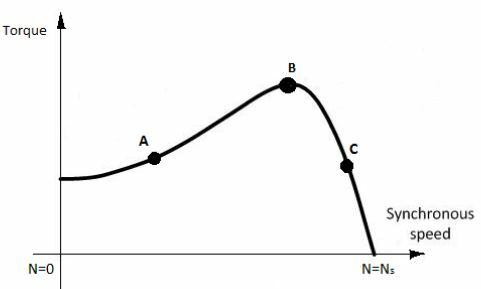 2(a) Explain the operation of AC induction motor at point A, B and C in the following figure. Which operation point is most suitable? Justify. 2(b) Explain the working principle of UPS. State their classification. Briefly discuss each type in detail. 3(a) Explain variable frequency control method of induction motor for two different working modes. 3(b) Explain state vector sequence and switching used in SVM. State advantages of SVM. Draw state vector sequence diagram for sector 1. 4(a) Derive expression for output voltage of single phase fully controlled rectifier in the presence of source inductance. 4(b) A separately excited DC motor with ratings 200V, 1000 rpm, 50 Amperes and $R_a = 0.2 Ω$ is driven using full converter fed with 230 V, 50 Hz single-phase supply. Determine firing angle of the converter if motor speed is 500 rpm at half the rated toque. Assume field winding is with rated voltage. 5(a) Derive and explain the average state space model of buck converter. Use this state space model to derive equation for output voltage of buck converter at equilibrium condition (dv/dt=0). 5(b) Explain in detail the working principle of buck – boost converter with help of neat diagram and waveform. Justify why the output is inverted.